to the Russian parliament (Duma) of the 6-th convocation. Voting results of SAO astronomers in the elections of Russian Federation President on 4 March 2012. Information sources: Commission No.123 protocol; Website of the Karachai-Cherkesia Republican Electoral Commission. The protocol data agree with the Commission data. See also article by Oleg Verkhodanov (in Russian) "How Nizhnyi Arkhyz disturbed statistics" in the newspaper "Troitsky Variant" No.99, p.8, on 13 March 2012. After publication of results of Russian parliament elections on 4 December 2011 by the Republican Electoral Commission, it was found a striking difference between electoral data of the district No.123 located in Niznyi Arkhyz, Zelenchuk region of Karachai-Cherkesia (the astronomers' village where the Special Astrophysical Observatory of the Russian Academy of Sciences is located), data of Zelenchuk region, and Karachai- Cherkesia as a full. So, the appearance of electors in the district No.123 was 49.1 per cent, and the voting result for United Russia party was 22.22%, in contrast with the mean appearance in Zelenchuk region, consequently, 94.3 and 81.25 per cent, and those in Karachai-Cherkesia, 93.0 and 89.84 per cent. Such a difference used to be explained by disparity in social and educational level, by difference in national content and by traditions of inhabitants of astronomers' village (those are engineers, technicians and scientists mostly russians and ukraineans), population of Zelenchuk region (kazaks and karachai people), and multinational people of Karachai-Cherkesia as a full. It is often mentioned in mass media about traditional large support of "United Russia" ruling party and its president candidates in Caucasian Republics. To establish the truth, we decided to do an independent estimate of electoral appearance in an accidently chosen district in Karachai-Cherkesia at the next elections of a president on 4 March 2012. We have registered at the WebVybory2012 portal in the district No.60 of the city Karachaevsk, where the local karachai inhabitants predominate, and a large number of electors are included in the voting lists. Both, at parliament elections on 4 December, 2011, and president ones on 4 March 2012, there were 2170 people in the voting lists based on data of republican Commission. Local Electoral Commission No.60 before the beginning of its work. This is a second district by a number content in the city of Karachaevsk. Our purpose was to count all the electors visited the district, received a bulletin and put it into the ballot-box. Additionally, we looked for the law violations both by the Local Commission staff, and visitors at the district specially noting possible carrying-out the bulletins from the district, and possible carrying-in the bulletins to realize a so called carrousels. Cameras were installed suitable to fix such a violations because both, the ballot-box and exit door were seen simultaneously. The observations were carried out continuously during all 12 hours of the district functioning, and they were not broken in order to eat and go to w.c. because we had notebooks and Wi-Fi. The observations were carried also during a poll but without the results, because only a small part of the table with the bulletins sorted was seen. So, we got to know the results of the poll only at the morning of 5 March from the site of Republican Election Commission. Both our observers were located in different regions of Moscow city, connected with a mobile communication, and co-ordinated their actions. We voted at different Moscow districts changing one another. The velocity of signal transmission by Internet was 70 Mbit/s. The image quality received was excellent without any stops and interruptions in transmission. We began observation on 7:15 Moscow time. Time counts in seconds marked in the frames of ...1330839532 relates to 9:40 of Moscow time. Barsukova Elena, senior researcher of the Special Astrophysical Observatory, Russian Academy of Sciences. We have counted a total of 1149 electors put the bulletins into ballot-box. The error of the number of bulletins put into the box is estimated as a few units (less than +/-10). The count error may be connected with some crowding people near the box when one had manage to count people but not bulletins. Once the box view was blocked by a woman, the Commission member. In two cases, family pairs put the bulletins into the box together and visible as one, but we counted them as two. We have fixed also possible carrying-out of 3 bulletins by 2 persons who passed over the ballot-box with white sheets of the same format as bulletins and went out of doors. We haven't note carrying-in bulletins to the district. The time graph of elector appearance is shown here. The graph of elector appearance. 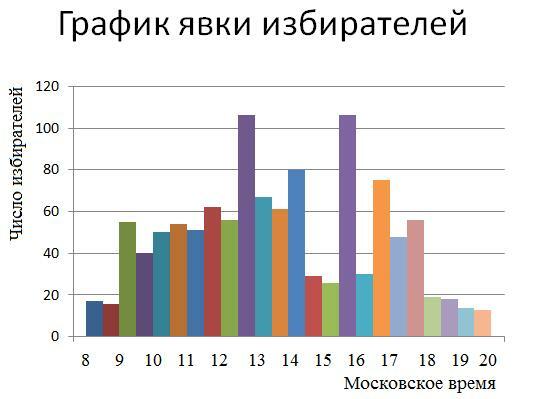 Absciss is Moscow time, ordinate is number of visitors each half-hour. Based on data by Local Commission No.60 present in pages of Republican Commission, 1578 bulletins were distributed in the election room and all of them were found in the ballot-box. The difference with our count result is very big, 429 bulletins. It was not possible to throw in the box such a number of bulletins unnoticed, even in the time when the box view was blocked by the woman, member of Commission. The slit of the box was so narrow that some electors had difficulties to force through it a single bulletin what was evident. Probably, the throw-in was done after the box opening with the indifferent attitude by surrounding people, and the table was installed especially in such a way for the camera view to be accessible only part of the table (see photo). Bulletin count by Commission No.60. It was possible that Commission No.60 count results were changed by a higher Commission. This fact of falsification is criminal offence, and it should be investigated using web-server records. This throw-in of only those 429 bulletins in the favor of acting authority candidate increases his rating from 64.4 to declared 87.86 per cent what is essential through a Republic. Based on our counts, the appearance of electors in this district was 52.5 per cent, what is a normal value and is close over the country for such elections. False appearance based on the Commission data is 72.1 per cent. Group voting. On 9:08 a group of about 30 women entered the election room who had rapidly tale bulletins (probably without presentation and checking passports). When this group voted, a woman, Commission member (red-haired with the identification table on the breast) took up position close to ballot-box and made notes in her sheet of paper looking at bulletins. 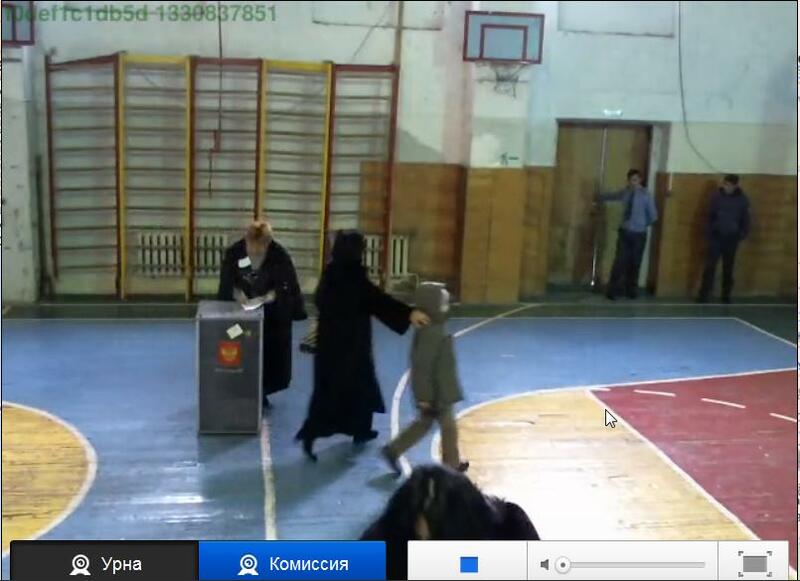 Then she put her sheet just on the ballot-box (see photo). With this action, the right of the secrete vote and free will of electors was violated. Being such a procedure made in favour the authority candidate, it gives him additional 2 per cent votes. Large peaks in the time graph of elector appearance suggest that the electors were brought to the district by buses. Commission member controls group voting process. Abuse of hand-held ballot-boxes. Based on Commission No.60 report on the March 4 elections, an unexampled large number of bulletins was distributed outside the election room, 251. No one another city commission had distributed such a number of bulletins, the other biggest number was 50. 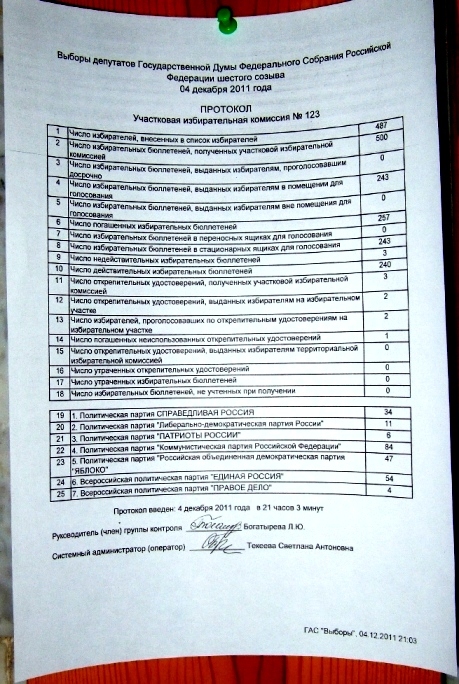 In the last elections on 4 December 2011, Commission No.60 distributed only 12 bulletins outside the room. Distribution of such a big number can be warranted with nothing. There was a normal good weather for the beginning of March, and no epidemic took place. Evidently, this was a method of legalization the additional throw-in of bulletins. 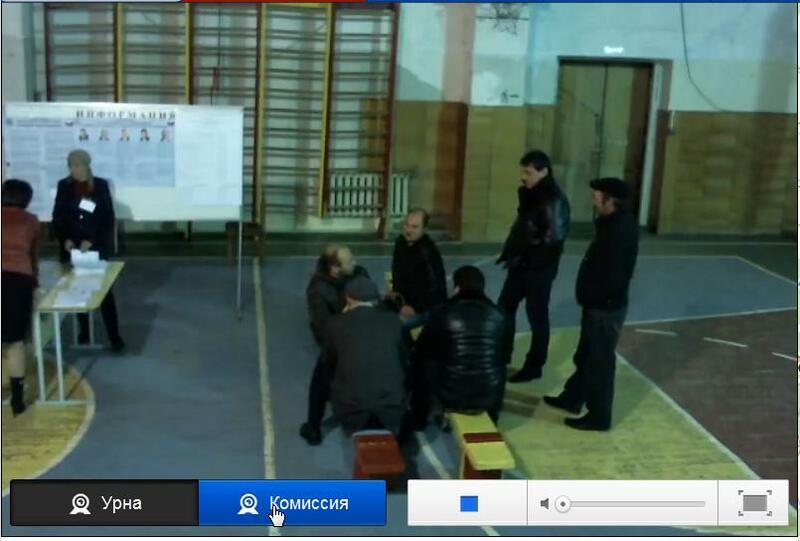 It is physically not possible to visit the apartments of such a number of electors for 5.5 hours (Commission members leaved the electoral room on 14:26 having 2 hand-held ballot-boxes). It results only 2 minutes and 36 seconds per one elector per 1 box. 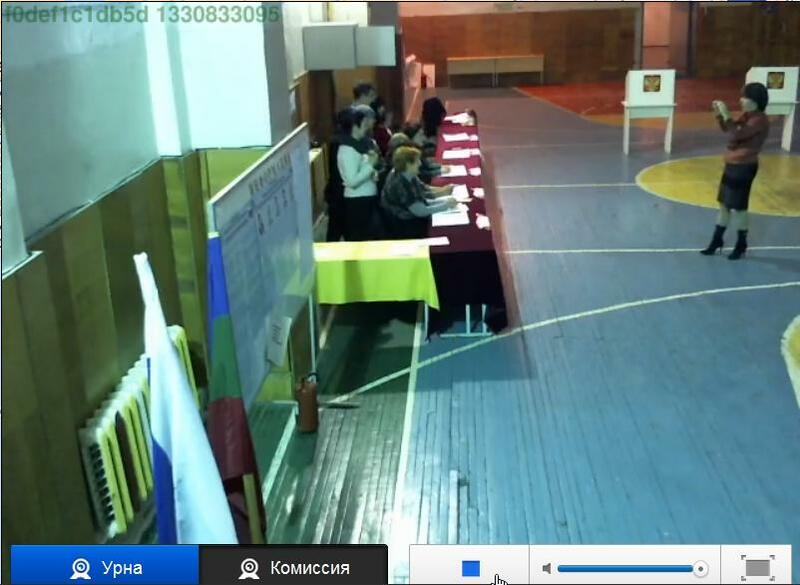 Bulletin count was hided from view of web-camera, counting results were not presented in the view at the enough close distance. in the city of Karachaevsk, Karachai-Cherkesian Republic. Now it is established that only in this district it was thrown in 429 + 251 =680 bulletins what amounts 37.2 per cent of total number of bulletins recognized as valid. Without any doubt, these votes were arrogated to authority candidate. If not, whom another one? With such an organization of elections there are no guaranties that votes for other candidates were stolen in favour of authority candidate. With all this going on, thieves hadn't stay any voices for two candidates. I have appealed to Republic Commission with a request to recognize the elections in this district invalid, but this appeal was stayed with no attention and reply, as usual. The results of 4 March, 2012 by Local Electoral Commission No.60 in the city of Karachaevsk given in the Central Electoral Commission of the Russian Federation are deliberately false and deserve no credit. Probably, the falsification is overwhelming in all the republics of the North Caucasus.